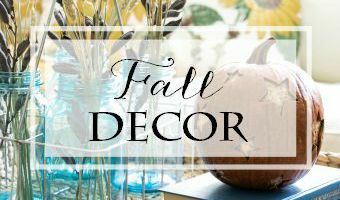 Hello…I’m back with the hope that you have a beautiful Sunday planned and also with a few Fall dining room decor ideas. I shared a bit of this room a few weeks ago in my Fall Home Tour. My dining room is small and is mostly taken up by the table and chairs. It’s a lovely set that my husband inherited from a cousin…which might sound kind of odd but when my blog was very new I told the story of how we came to own it. Along with the table and chairs we also got two incredible corner cabinets. I would have never been able to fit a bigger sideboard or china hutch in the room so I felt very lucky. I know dining rooms are sometimes considered wasted space. Honestly, as much as I love this room, it’s hardly ever used. That said, I can’t imagine living in a house without a dining room. So wasted space or not, I always add seasonal touches even if no one sees them but me! The tablescape is very simple. Pier One chargers, Walmart plates, DIY linen napkins and small plates from my wedding china. I love the velvet pumpkins and I will actually be sad when I have to put them away! I realized when I was editing these photos that I didn’t have a shot of either corner cabinet. The tablescape is gone and there are a few changes but I managed to get one good picture. Photographing this room is always a challenge because there just isn’t much space. I hope you enjoyed looking around! As always, thank you for taking time out of your day to stop by. If you are raking leaves, just keep thinking what good exercise it is! 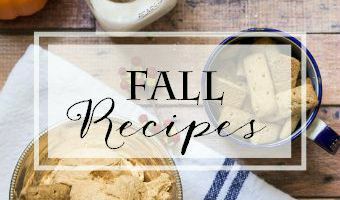 Here are my favorite fall categories if you have a minute to take a look! 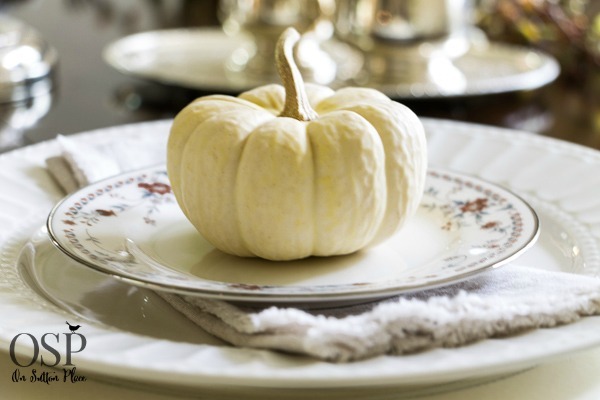 Your tablescape is simply charming. Where did you find the velvet pumpkins? Such an unexpected glamour. Thanks for your inspiring blog. through worst of it. You have become an entrepreneur! I’m signed on to follow your blog and thank you. Ps I quilt in my free time and am retired-happily! 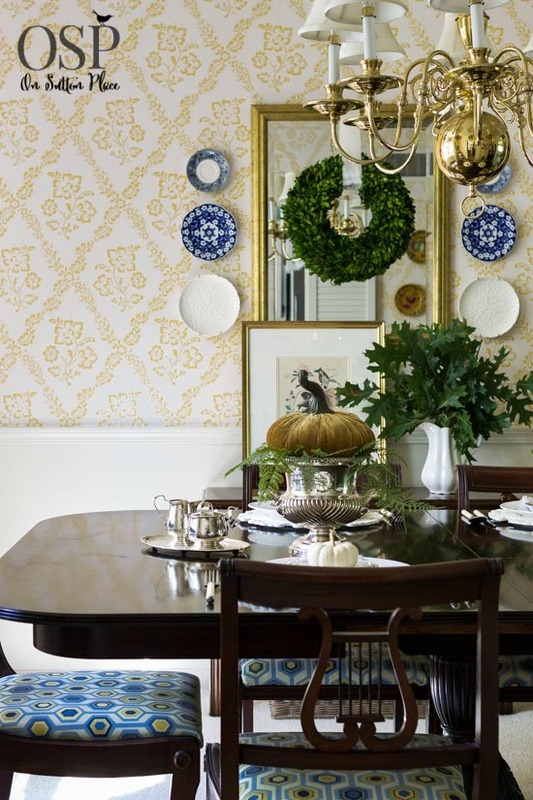 You make an excellent point that a formal dining room is a great place in a home to turn into a seasonal display space. Our house has a formal dining room space, but we have never used it in that way. I elected not to put an overhead light fixture in the center of the room, but instead have sconces and a small hanging fixture at the edge of the space in front of the window. We call the space our wine/library/game room….it has a game table with two chairs, a small settee, a chair, and a rather oversized glass fronted two piece cabinet that is used to house glassware, liquor, wine, book and collectibles. The room is painted quite dark and its has lamps on the side tables that flank the settee. We like to have a glass of wine there, read the paper, sip tea and play games. I do put in small seasonal decorative touches but generally only for fall and Christmas. Table looks wonderful, especially with the Noritake Adagio plates. That is the same e pattern as my wedding china. I alsovlove the chargers too. Keep wanting to purchase those too. I think I will just come over and enjoy your table instead! Lovely room. Perfect decor…..just enough. You do a really great job. Such a pretty Fall dining room setting Ann! I would love to have dinner with you, Tom and the family. 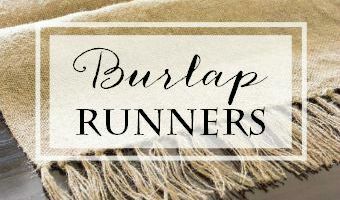 I just recently started following your blog, Ann, and I am so glad I did!!! Your home is truly lovely!! As for the dining room-I absolutely love your tablescape (your wedding china is GORGEOUS), and I’m green with envy over those corner cabinets!!! Wonderful job,love your corner cabinet,don’t see those often,have a great day. Just so beautiful! I love your clean, not cluttered style! Well, I love your style! Just love your site!! Thank you for sharing! Your dining room is lovely. Your dining set is beautiful. You just don’t see pieces like that much. 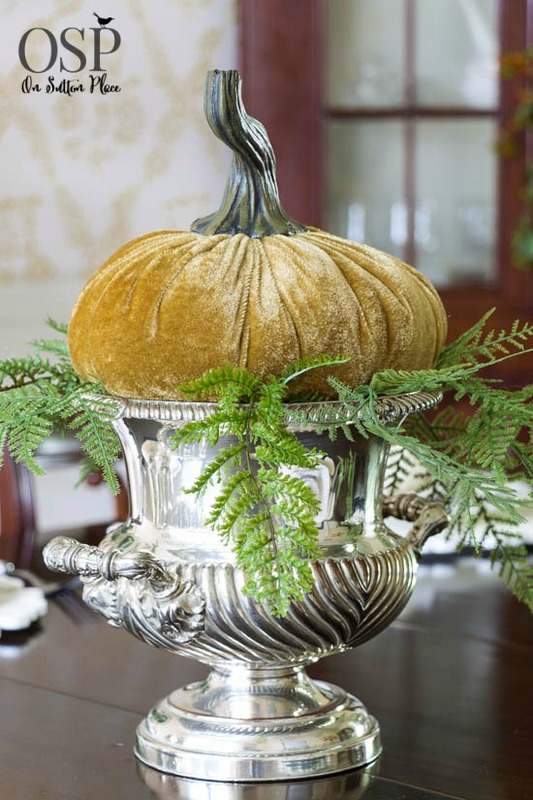 I especially love the pumpkins on the silver decanters, It really says Fall season and it reminds me of home. 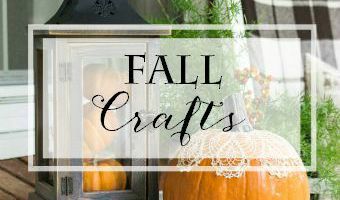 Love your fall decor, LOOKS so fresh and beautiful. Thanks for all the hard work you do to entertain us and give us inspiration, I have some medical problems at this time and unable to do much decor, so I enjoy all the great things you bloggers do. You have a beautiful dining room. Why don’t you have breakfast or dinner in there once a week? Enjoy your beautiful set of furniture! I would love to sit at your table with my coffee and newspaper while working on the crossword puzzle. 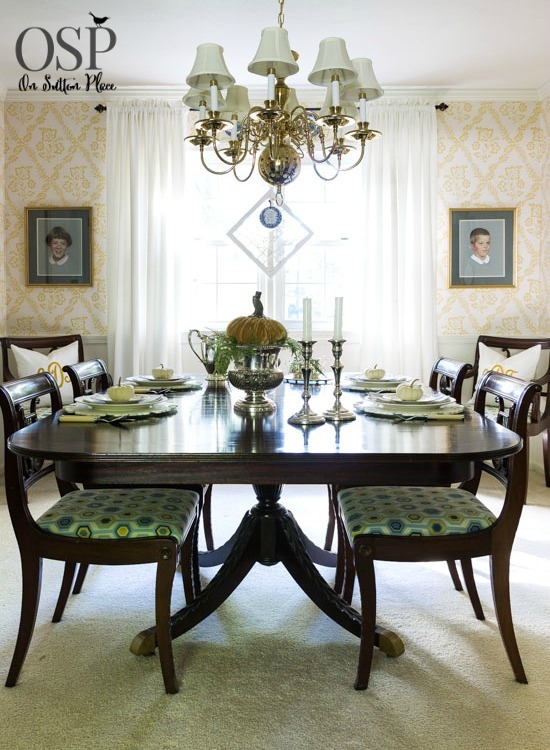 Such a beautiful and elegant Fall dining room … the fabulous place settings … velvet pumpkin … stunning vignettes! As always, so inviting, just waiting to be filled with family for the holidays. I think your dining room is bigger then mine. I am redoing it as I write this to you. I am using a mirror on the only wall (where my china cabinet use to be) that will be placed near the dining room but not in the dining room. I will be posting pictures on my blog as soon as I have completed the rooms. We are getting new rugs and the place is such a mess. Can’t wait for this to be finished. 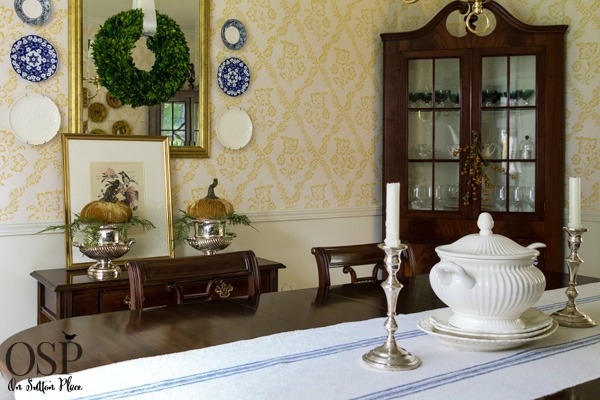 Your dining room is just lovely, Ann, with a sense of family and tradition. It is just as a dining room should be, and I must admit that when I see this, I really miss our old house that had a traditional dining room, not the open plan we have now. It was in the center of the house, so it was used all of the time, for meals, a cup of tea with a friend, or a project with the grandkids. You have warmed my heart today with memories as well as inspiration for decorating! Thank you Laurie for taking the time to leave such a nice comment! Stunning Ann!! I love the velvet pumpkin and fern in your silver champagne bucket!! Beautiful as always Anne, I love the velvet pumpkins as well. Did you make this or purchase it? I just decorated my rarely used dining room as well this past Friday evening ~ surprising how many times now that it has been “seasonally adorned”, that I make the effort to peek in and enjoy the view! Hi Lisa! No I didn’t make the pumpkins…they came from Hobby Lobby! Well, Ann— My husband and I will be in your neck of the woods for a few days as we begin or journey over to Niagara Falls and onto Prince Edward Island. We are going to visit some of the Amish country and a friend said we have to visit the Warther museum and button museum. This is our first trip to Ohio and we are so looking forward to it. I would love to meet you if you were close. Hi Jeanette! I am not close to Amish country at all…but I hope you enjoy your time in Ohio! Very pretty, Ann! I think your room is just the perfect size. I love the chargers, I have to check out Pier 1. 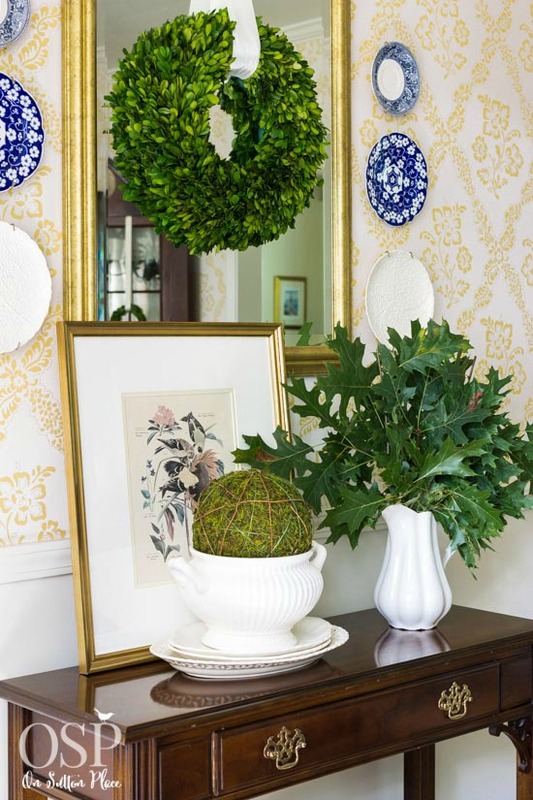 And the boxwood wreath? I ordered the very small ones from AF to hang off the back of my dining chairs with ribbon at Christmas…have you seen that done? It’s precious! I have a big boxwood wreath that is now a year old and not fading or aging one bit (in spite of my not misting it with water regularly!). I just laughed out loud Jane…I have never misted my wreath either! I did buy some of the little wreaths but am not sure how I’m going to use them. Thanks for stopping by! 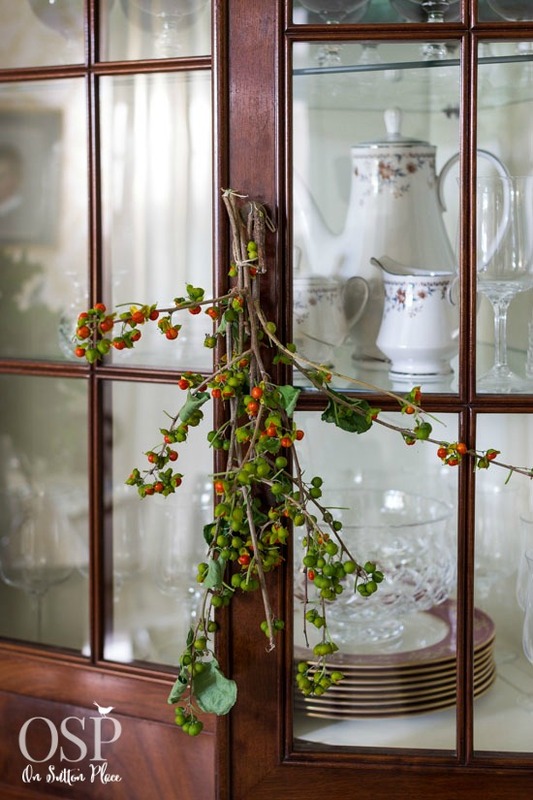 A dining room full of family history with the warmth of your autumnal touches. The simplicity of your choices appeals to me as I tend toward simple and effective. It looks perfect! I love how you used the velvet pumpkins. Just beautiful, Ann! Your home is always so warm and welcoming. 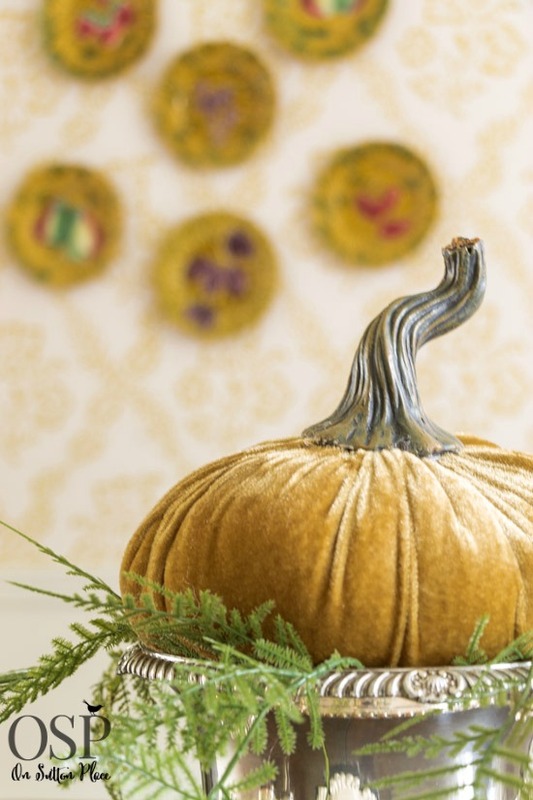 I love, love the velvet pumpkins I see everywhere! Did you make yours? Thanks for sharing ~ hope you have a wonderful Sunday! Hi Pat…no those velvet pumpkins came from Hobby Lobby! Simple but elegant. I love all of it! Ann, what a lovely room. I absolutely love your velvet pumpkins, can you tell me where you purchased them? Hi Cheryl…the velvet pumpkins came from Hobby Lobby! I love how simple and elegant your dining room looks. So pretty…. Your dining room is lovely Ann. I love the table chairs and corner cabinets. As always, your dining room looks just lovely, Ann. Love the bittersweet hanging from the cupboard. I solved the problem of never using the dining room by putting in an oversized farmhouse table. Now that it looks less formal, we use it all the tme. What a beautiful dining room. 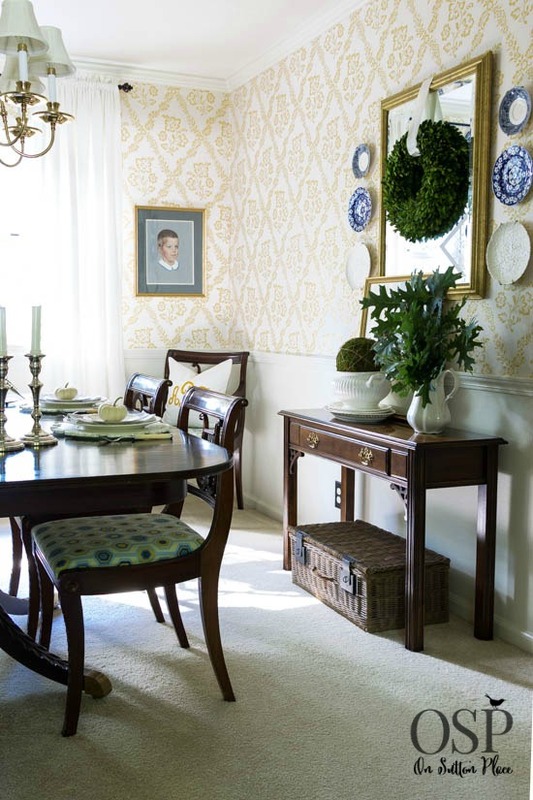 It would be much fun to have a separate dining room to decorate! I love your Fall dining room decor. It’s just right! It did make me a little sad to see your dining room table and chairs. I just downsized into a tiny beach cottage w/out a dining room. I had a table/chairs identical to yours. And I miss them and decorating them for the season. Its a tradeoff though as I do love my cottage by the sea. I would love to share pictures if it you’d be interested. I now have a lovely patio in front of the cottage where I entertain. That’s a lot of fun for me and guests. Its always a work in progress which as decorators, we always have a project or two. I do love the bittersweet hanging on the doors of the corner cabinet. Beautiful “sweet” touch. Thank you Paula! I think a cottage by the sea sounds lovely…I think I would even give up my dining room set for that! love your decor. I also love the velvet pumpkins but I may just have to display my collection of glass, velvet etc somewhere. I hate putting them away! Thank you so much for stating that your chargers were from Pier 1 and plates from Walmart. Years ago my family had lunch with a couple from our church who were know to be millionaires; their house was huge. She served lunch on plates that were given away as a premium at the local grocery store. She was a humble and beautiful woman. Sometimes I struggle that my dining room furniture is not the style I’d prefer or that my kitchen needs updating. But I’ve learned that Dave and I are the reason people come to visit, and that’s more important. Updated kitchens don’t make a welcoming home…your special touches do. I don’t have an updated anything in this house…not that I wouldn’t love it but I doubt it will ever happen. Work with what you have and I promise it will always be perfect. I just wanted to say that I am new to your site, and I really enjoy it! Your home is beautiful and I enjoy your decorating tips since many of them look like things you can pick up when outdoors! Keep up your good work! Thank you Joan and welcome to On Sutton Place! Your dining room is so elegant. 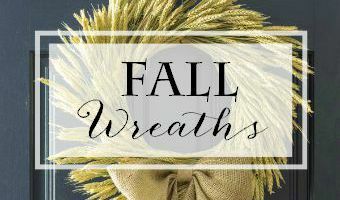 Love the boxwood wreath and those cute pumpkins too! It all look terrific Ann, the velvet pumpkin is just splendid. We also never use the dining room, I would vote to change it to a sunroom some day, if I ever find the time. 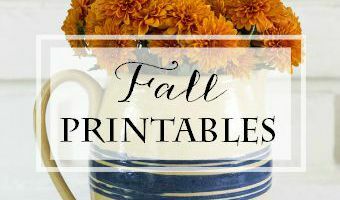 I love your fall decorating in your dining room. I too inherited a dining room set, but mine is from my grandmother. It is circa 1936 and I haven touched it, but after reading what you have done to your corner cupboards I am seriously considering painting it and adding glass shelves to my China cabinet like you did. I will be sure to send you a picture via facebook when I’m done. Thank you for taking risks and sharing. Thank you Heather…I’d love to see pics!